Paavo Heininen got down to a serious composing career, geared from the outset towards large works, at a relatively early age. This beginning came in the late 1950s, when both dodecaphony and its historical offspring serialism were making their entry into the Finnish musical arena. The newcomers encountered stern resistance: the fact that a couple of composers had determined to use the new method in no sense meant that musical life in general was ready to welcome the fresh ideas with open arms. The early years of Heininen's public life are aptly reflected in the fate accorded his Symphony No. 1, from 1958. The conductor deemed it to be too difficult, so only the first and third movements got a hearing. For the audience of the day it remained an incomprehensible oddity. "The myth of an enfant terrible of Finnish contemporary music took wing immediately, and stayed aloft a long time", wrote Jouko Linjama of the event. The story is a fairly classic example of the reception awaiting dodecaphonic works at that time in Finland; from the composer's viewpoint it was a shame that this was to remain for some time his only real claim to fame. Another significant point with regard to Heininen's development as a composer was the trauma caused by the symphony's hostile reception. This shows up in his output as a sort of Janus-effect, a dichotomy which he examines in an article included in a 1976 collection edited by Erkki Salmenhaara Miten sävellykseni ovat syntyneet (What's Behind My Compositions). Heininen felt a conflict between himself and his environment which he tried to solve by composing on the one hand works which were purely "of his own making", from his own innermost worlds, and on the other hand a variety of differently directed and shaded pastiches, which offer only a glimpse of his personal patterns of thought. Although this double-sided model is by no means a constant, it characterises neatly Paavo Heininen's output well into the 1970s, and in some respects even further. An early and demonstrative example of these pastiches is his Symphony No. 2, Petite symphonie joyeuse, written in New York in 1962, which quite unlike its predecessor moves unabashedly in the direction of neo-classical ideals. The entire approach is simpler and the dodecaphonic constructivism has been left more in the background. This is partly a result of the stylistic atmosphere in New York, where he was studying with Vincent Persichetti. Right from the outset dodecaphony meant a basic point of departure for Heininen. Its importance was all-embracing, and as such it differs from the ways in which this method affected most other Finnish composers. For Heininen dodecaphony meant a means of realising all manner of musical ideas and models. Equally he did not retreat, after his first 12-note sorties, back into the camp of those who led the anti-dodecaphony reaction. Looking back over Finland's thin, short dodecaphonic period this backlash seems to have been a rather exaggerated business, based on instinct and little else. However, what is important is not so much Heininen's acceptance of the method, but the fact that it had (and still has) a real impact on the shape of his music. Thus in the 1960s and still later Heininen's compositions stood out from other contemporary Finnish works in their richness of contours and precise detail. An interesting early example of Heininen's unorthodox, pastiche-like application of 12-note ideas can be found in his Musique d'éte, Op.11, from 1963. He rewrote the score four years later, adding two more instruments to the original quartet line-up. The piece combines the precise working-up of details and a sinewy, symmetry-seeking constructivist form with a light playful and airy poetic quality in a fashion that works greatly to the advantage of the latter. Still, it is the measured absoluteness of the structure which makes Musique d'éte what it is. A fruitful polarity is created: in Heininen's own words, paraphrasing Ligeti, "the motleyed sensual cat-world of the music criticises the serious gestures of rational music and sets them up as faces on a polyhedron with all the others, sometimes together covering one another, reflecting and refracting one another's light." As a counterweight to the levity and brightness of Musique d'éte, Heininen's next work Adagio .. concerto per orchestra in forma di variazioni, Op. 12 is a massive and serious orchestral monument. This was unquestionably the composer's most important contribution prior to his 30th birthday, and is still one of his most remarkable works. As with Op. 11, Heininen wrote this composition twice: following the first performance in 1963 he withdrew it and a revised version appeared in 1966 to be given its first airing at the Camden Festival in London the following year. The Adagio is written for a large orchestra, with quadruple woodwinds (and four additional saxophones! ), six horns, and as many percussionists. The orchestral form is dazzlingly multicoloured, but for all this the instrumentation cannot be accused either of being annoyingly gaudy or even "thick", so often the cardinal error of a young composer in his first work for full orchestra. The instrumentation of the Adagio has rather been thought out in chamber music terms, with different instrument sections and their respective combinations brought out in turn. Since the form is based on a re-interpretation of classical variation form, the changes in colour produced by the dialogue between instrument sections take place naturally, following the moods of the variations. On its first performance this concerto for orchestra was labeled by the press as Hommage à Mahler. It would be a splendidly apt name, were it not for the unfortunate associations it calls up for today's reader. The Piano Concerto No. 2, Op. 15 (1966) belongs among the composer's stylised, audience-wooingly simple creations. His treatment of the piano part is typically diverse and complex. In contrast, its relationship with the orchestra has been solved in classical fashion, without unnecessary complication. The movements are named with a nod to examples from the past: sonata, nocturne, and ricercata. In much the same way, Arioso Op.16 for string orchestra, composed in the spirit of Mahler or Hartmann, sees Heininen's answer to the question of how to compose easily approachable and digestible music without losing the essentials. Arioso is melodically contrapuntal in character. At the close the texture is compressed via some natural flageolet notes into a quasitonal, surprisingly idyllic musical landscape. History has a habit of repeating itself, particularly when you don't want it to. The first performance of Paavo Heininen's Symphony No. 3 (Op. 20, 1969) was like a re-run of the events surrounding his first symphony ten years earlier, in that only half of the work was presented. The 3rd Symphony represents another chapter in the composer's unravelling of the paradox between the concentration of thematic work and the runaway growth of his material. It is actually worth noting that in the article mentioned above Heininen polemicises with gusto against the conception — to his mind an obsolete one — that there should be some unresolved conflict between a symphonic method spreading out from one starting point to many, and one which funnels down from many to one. The set-up is a familiar one, at least to Finnish music circles, from an anecdote told about the discussions held between Sibelius and Mahler in 1907. It is said that when Sibelius declared that he admired above all the irrevocable logic of symphonic form, Mahler countered: "No, no, the symphony must embrace everything, everything!" According to the composer the 3rd Symphony can be understood as being in either one, two, three, or four movements; it is played without a pause, and is about 45 minutes in length. The orchestration of the symphony is a chapter unto itself. Heininen conjures up imaginative combinations from his palette, and in particular the two-piano gamelan group gives the work a colour all its own. Symphony No. 4 (Op. 27, 1971) is to its predecessor what No. 2 was to the 1st. In the same way that the composer, disappointed by the fate accorded his first symphony, tried to limit and simplify his message and wrote the Petite symphonie joyeuse, so he now again withdrew into his shell, reduced his arsenal, classicised his forms, and stuck the name Sinfonietta at the head of the score. The work is in two movements, and both are given a diminutive heading: allegretto and adagietto. After the 4th Symphony the symphonist Heininen has thus far remained silent. Time will show why this is: whether it is that new stylistic-syntactic impulses have distanced him from symphonic thinking, or whether Heininen is still gestating a new, forward-looking addition to the series, in the same mould as the odd-numbered ones so far. In his concertos written in the 1980s he has clearly remained on the virtuoso concerto track, and has not taken his solutions in the direction of the symphony. Heininen's Op. 32 can unashamedly be given the attribute magnum. It takes in his String quartet and three works for piano: the Sonata per pianoforte, subtitled Poesia squillante ed incandescente and two collections of small pieces Préludes - études - poémes and Poésies - périphrases. The quartet and the piano sonata are large works, mutually polarised and complimentary; when speaking about his Op. 32 at a composing seminar at the Sibelius Academy Heininen declared these two giants to be "the same music", a comment which may have led to a few blank faces in the audience but one which certainly has more than a grain of truth about it. The other two works seem to have been compiled from left-over material; at least Préludes - études - poémes is of much more modest intentions than the two large works, and serves splendidly for instance as a practice piece for use in teaching. Poesia squillante ed incandescente is an exceptionally large work for a piano sonata. It lasts some 40 minutes in performance, and in each of the three movements the player's skills are put to a severe test. The piano treatment is colourful. It is played both conventionally from the keyboard and also directly from the strings; flageolet notes ring out like church bells, and the keyboard-generated surface texture, nimble and often moving in the upper registers, is reminiscent of an orchestra of countless little bells, which periodically works itself up into persistent, lingeringly sensual orgies of sound. The first movement, entitled Cuneo (from the Latin for "wedge"), treats the relationship between two contrasting subject groups on the earthly level, while in the slow movement the idyll conjured up, which occasionally takes on some rather spooky ghostly shades, is undoubtedly not of this world. The finale declaims fiercely on behalf of its right to exist and steamrollers its way manically towards the irrevocable climax. The title for the String Quartet is given on the cover of the score in Polish: Kwartet smyczkowy. This might be a mark of respect for Lutosławski, whom Heininen greatly admires - or it could as easily be any other memory of Poland. In any event, the exemplar lurking behind the work is not the grand old man of contemporary Polish composers; Heininen himself has spoken of Alban Berg in connection with the piece — and here more with the world of his Op. 3 than the Lyric Suite. The Piano Sonata in Op. 32 stretched the resources of pianism to their upper limits. When Heininen was subsequently invited to compose a piano work "for the use of non-specialists", he saw that the time had come to cross those limits at a single bound. To aid him in this he needed a tape recorder, and the resources of the tape engineers. In all its fantasticalness and incredible pliability Maiandros is undoubtedly one of Heininen's finest compositions; certainly it is the most shocking. Maiandros has been made entirely without electronic sound modulations or synthesising. The material was played on two grand pianos tuned to different pitch, and the processing methods employed were the familiar mechanical tricks of tape music, such as speeding up and playing in reverse. Maiandros falls somewhere in the no-man's-land between piano music and music for tape, a fact which the composer has found problematic when placing the work in concert programmes - the typical human tendency of shoving everything into neat pigeon-holes often shows up in a more or less aggressive and violent stance towards items like this, that do not comfortably fit into any one category. "It created a stereophonic piano menagerie, a hall of montage mirrors and prisms", wrote Heininen at the time. Maiandros has thus far remained a one-off event; this fact perhaps helps to emphasise its "comment" character. Still, tape is also needed to assist in performances of Gymel, Op. 39 (1978). The name means twins, and in this instance the twins are bassoon and water. The piece is a duet for bassoon and tape, with the latter consisting solely of water-sounds: drops, rippling and babbling water, splashes, and the surge of the waves. Since the two protagonists are here so very different, the composer has understood his task as bringing them together. Gymel does offer several alternatives for finding points of contact between the universal element of water and the solitary bassoon rolling around in a world of its own. By the end, what had perhaps initially seemed strained and artificial has perceptibly found its niche; everything sounds right, almost "taken as read". The bassoon part itself has been written in the intensive style typical to Heininen's wind solos, and if it had not found its way here to be a partner for H2O, it would almost certainly have become the fourth in his Discantus series of solo works, following those for alto flute, clarinet, and alto saxophone. Tritopos (Op. 38, 1977) won 1st prize in the orchestral composition competition arranged by the Finnish Composers' International Copyright Bureau Teosto on the occasion of the bureau's 50th anniversary. In many respects this shortish (14') piece continues the line established by the Third Symphony some eight years earlier. One new feature, however, is the acknowledgement of time and space: in line with the Greek title of the work, the orchestra is divided up into three main groups, between which the sound masses are allowed to wander. In spite of its later Op. number, Tritopos was actually completed before the larger and rather weightier study Dia (Op. 36, 1979). The title comes from the prefix for "through", or "across", and thus during the half-hour or so of Dia the material is taken through differently directed and weighted phases. These are characterised in the names given to the various sections: ... line to plane ... , Flow, Movement, Grain, and Energy. Perhaps the most interesting phase is the fourth, which charts out the graininess of the musical surface and its impact on the overall shape of the music. Of the orchestral works written since Symphony No. 4 in 1971, Dia comes closest to being a symphony. Perhaps it is its weighting towards the study of only one musical sketching process at a time which decided the composer upon calling it something else. The orchestra for Dia is neo-classically small, but the treatment is many times more colourful than this modest lineup might suggest. The opening gesture points forwards to the opera The Damask Drum (1981-84). The first couple of figures are only mimetic, without sounds. The Concerto for piano and orchestra No. 3, Op. 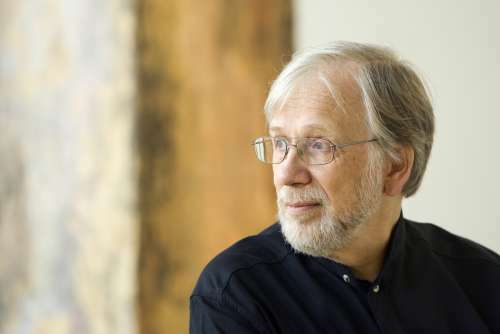 46, 1981 took part in the Maj Lind Piano Concerto Competition arranged by the Sibelius Academy, where it shared 1st prize with Usko Meriläinen's (b.1930) Kinetic Poem. The concerto continues the series begun with the two successive works of the mid-1960s, and surpasses in all respects its predecessors in this area. The piano text is richer in nuances than earlier, although one musical gesture seems clearly to dominate, namely a sudden, surprising shower of notes. The concerto's form is built up in interesting fashion out of these showers and the orchestral comments given in reply. The general tone of the piece thus comes down somewhere between extreme nervousness and let-it-all-hang-out merrymaking, and Ravel can be just dimly made out not too far away as a godparent for the concerto. One unexpected feature is that in its comments on the wild clowning around of the piano the orchestra more often than not submissively takes the idea and carries it on, and so does not really operate as a counter-force against the soloist hustling around in his rather strange and excitable state of mind. In its remorseless action and unpredictability the 3rd Piano Concerto is an example of the most refreshing Finnish instrumental music to come out of the 1980s so far. At the same time the classically light, airy type of music which pops up every so often among Heininen's oeuvres here gets its most competent and amusing treatment. Compared with this, the Saxophone Concerto Op. 50, 1983 is from a different planet. The most important reason for the difference lies naturally in the differences between the two solo instruments. The zip and pep of the piano concerto is here replaced by a graceful melodic quality, and there is no trace of its surprise-packed angularity in the calm, in places almost "epic" progression of the wind concerto. The soloist line is dominated by an orthodox bel canto, and only in the second half of the latter part of the work, entitled Song and Dance, do the normal gestures of the virtuoso concerto win the day, and riot even here do we get anything much by way of a heroic culmination to the work. The landscape remains lyrical throughout, and the composer's characteristic relatively fastrising orchestral tuttis never get to ruffle the disposition of the piece, which is shot through with the poetic sound of the saxophone. On the basis of a brief acquaintance, the Cello Concerto Op. 53, 1985/86 can be placed somewhere between the 3rd Piano Concerto and the Saxophone Concerto, and perhaps just a shade closer to the former. A review by this writer of the first performance of the work, given in Helsinki in late February, can also be found in this issue of FMQ. The latest addition to the list of phenomena Paavo Heininen has approached alongside his composing career is the computer. In a short time he has delved deeply into the development, potential, and problems of the field, and he has shown a particular interest in research into artificial intelligence. Delivering a lecture to architects at a cross-disciplinary seminar he went as far as to specify research into artificial intelligence as being currently the most important auxiliary science for aesthetics. Thus far the most noteworthy artistic collaboration between Heininen and the computer has been the “nonette avec milieu” Dicta Op. 49, from 1983. This 15' piece is written "for 9 + 14 players distributed among the audience". The work was premiered at the Helsinki Biennale of 1983, where it was played by the Paris-based Ensemble InterContemporain, for whom it was also written. On just the one hearing Dicta leaves a pretty wild impression. The games it plays with the spatial relationships of individual sounds and sound-masses are so complex that one can easily believe the computer to have been an essential tool in the working out of the score. Vocal music makes its first real appearance in Heininen's output in 1968, with the extensive cantata Cantico delle creature Op.17. The text is from St Francis of Assisi's song of thanksgiving to God for the Creation and its results. The history behind the cantata tells that it was originally composed as a baritone vocalise. In this case, too, Heininen was thus approaching a new area methodically and carefully. The vocalise is joined by counterpoints, it is imitated in the various voices of the accompaniment, and counterpoints are built on it. The chordal basis for this solid, massive set-up is found in pedal sounds - the accompanying instrument for the cantata was originally the organ, although the work has also been presented in a piano version. During the sung sections the texture remains characteristically polyphonic. Although the tone of the various verses differs greatly according to the part of God's creation in the spotlight (Brother Sun, Sister Moon, Brother Wind, Sister Water, Brother Fire, Mother Earth, etc.) there are no essential changes in their texture. On the other hand the interludes between verses, although they derive their material from the vocalise and its counterpoints, have a more skillfully woven texture and this brings the work some necessary contrast. The cycle of three songs for tenor and piano Love's Philosophy (Op. 19, 1968/1973) is playful and teasing in character. It deals with a young man's love and lovesickness, offering a smilingly warm humorous treatment of the subject. The poems providing the lyrics are from Shakespeare, Shelley, and W. B. Yeats. Quite another cup of tea is the German set - again three songs, this time for mezzosoprano - entitled Schatten der Erde (Op. 30, 1973). Its themes are evening, autumn, twilight, sadness, and shadows. For his poems Heininen has chosen Andreus Gryphius's Abend, Rainer Maria Rilke's Herbsttag, and Friedrich Hölderlin's poem Hälfte des Lebens. Although the cycle is permeated with a melancholy and in places even desperate atmosphere, there is in the songs, in particular the Rilke one, also a healthy dose of no-nonsense strength; a sort of lucid, open authenticity, like the feeling brought by a crisp, clear high-pressure autumn day. This is a definite foretaste of the atmosphere of The Damask Drum. A new step forward in Heininen's vocal expression came with his Reality; Op. 41, written in 1978 for soprano voice and 10 instruments. The work is built up of arias to texts by Eugenio Montale, Pierre Jean Jouve, and Anaïs Nin, and in between these are slotted vocal etudes, Heininen's treatment of the human voice is here several steps more modern than in the previous works. He makes use of the soprano's potential both as a soloist and as one of the instruments of his orchestra. Numerous details generated with changes of colour add their own shades and tinges to this virtuoso tone-game. With the benefit of hindsight the solo part seems to have a parallel in the role of the Princess in The Damask Drum, albeit that the soloist in Reality might actually be given a tougher time. In any event, in this work Heininen achieves that vocal composing norm which regulates the singing in The Damask Drum. In actual fact the composer was probably already well advanced on his opera plans by the time he composed Reality. Still, it could be argued that Heininen had approached even closer to the world of his opera in 1970, when he composed The Autumns, Op. 22, his most important choral work to date. Like the opera, this autumnal choral piece is based on a Japanese text, with the words taken from the haiku-verses of Matsuo Basho (1644—94) and other poets. Heininen uses the English translations by R.H. Blyth, but also includes Japanese words, which give added colour and serve as phonetic material — a feature which is repeated almost verbatim in the later opera. It is also worth noticing that as well as the origins of the text the subject itself, autumn, is part and parcel of the world of The Damask Drum. Heininen seems to have adopted autumn as his own season, and we can perhaps discount as mere flirtations his brief affairs elsewhere, in Musique d'éte and Libretto della primavera (Op. 28, 1971, for solo piano). So writes Paavo Heininen in the notes to the libretto of his opera. The opera is based on the classic Japanese Noh play by Zeami Motokijo (1363-1443). This was suggested to the composer by Eeva-Liisa Manner, who also provided the Finnish translation. Manner is one of Finland's leading modem lyricists, a sensitive exponent of deep feelings with an exceptional beauty of expression. Heininen did the actual libretto modification work himself. One notable point is that for an opera lasting an hour and a half The Damask Drum contains relatively little by way of text and events. A great part of the time is taken up with chorus- and ballet scenes, which provide the work with a certain look, but do not actually try to carry the plot forwards. All the various dramaturgical factors have been given an important, deliberate role. Heininen has actually given his opera the sub-title of Concerto for singers, players, words, images, movements ... — or as it could also be expressed "Concerto for Opera House" — which further underlines its multi-media character and adds yet another comment to the endless "new Finnish opera house" debate. Lake profound as autumn light. But not as old as I.
O clouds of bird' wings! "Now the autumn wind is cool How lovely, walking on the shore Just you and I." Although there is no actual meeting between the two parties (even visual contact is only on the side of the gardener), the miracle of falling in love takes place in his mind. He knows he has to see his beloved princess and her silken robe again. The chorus tells us that love knows no boundaries. According to the princess herself, not even the Thunder-God can separate those that love has joined together. But for the solitary gardener all this is much more than mere words. "Those whose destination in their minds is clear Can never be prevented from attaining it"
Love, and by definition its corollary Hate, are powerful enough motivations, and therefore not even Death and the grave can hold the gardener back. As can be seen, for all its apparent oriental background, the story has a thoroughly universal quality about it. Love and love unfulfilled, redemption and revenge are all themes known everywhere. This is a fairy-tale, in the way that for instance Mozart's operas are just that. In keeping with the genre, we must have the level of miracles and wonders. But should we I wonder regard the miracle as being the breaking down of reality, the demons and the supernatural events; or is it - ultimately - only the act of falling in love, something so powerful which has its beginnings in something so small? According to what the composer has said, the most important single musical theme in The Damask Drum (Op. 45, 1981—84) takes shape from those desperate efforts at making the silken drumskin play: silence, a visual rhythm, followed by an aural echo and commentary. At first tirelessly eager, then increasingly desperate, the four Rites of Drumming scenes played out in silence are startlingly effective. In terms of its musical make-up The Damask Drum manages to be both a homogeneous and heterogeneous work. It contains a great many different "musics" - the gardener's music, the women's music, the music of the demons, water and current music, and the silent music of the drum are the most important, and their characterisation has been taken to such a pitch that it is difficult for the ear at least to pick out common points between them. On the other hand, the work is solid and coherent, in terms of its sweep from beginning to end an exceptionally logical creation. In actual fact the dynamic arc of The Damask Drum could (with a modicum of simplification) be interpreted as a single giant crescendo, in which not just the music increases in intensity, but also the dance, the lights, and any other factors and features one cares to name. The form of the opera is governed by the form of the drama in the background, by the progression of the plot. But there is another construction built on this foundation, the basis of which lies in the scene-types and musical forms of the old number-operas. In the musical scheme for the scenes of The Damask Drum we can make out words like Introduction, Cantilena, Duetto, Arioso, Interlude, Aria, Terzetto, Monologue, Arietta, Cabaletta, and so on. These musical numbers can be picked out from the overall whole, but still it would be wrong to regard Heininen's opera as a direct descendant of the golden age of Italian opera. The force holding things together is on the one hand the storyline, but no less just that logic which creates the musical uniformity of the piece. It is very hard to put a finger on it, to pin down, but it is definitely there, and its powerful presence supports the work as a complete entity. The Italians would compose a number at a time, while Alban Berg adopted symphonic structures. Heininen comes somewhere in the middle, and his originality is ensured through the variety of the solutions he chooses. The main character of The Damask Drum, the gardener, is written for baritone, and it makes good use of just about everything that can be created on the strength of this voice. The role is undoubtedly a heavy one for the singer, but then again the picture it presents of the solitary suffering gardener is also exceptionally impressive and authentic. Rather more imaginative still, however, is the way in which Heininen uses his Princess and her two ladies-in-waiting. The music composed for the three women is the most sensual and beautiful Heininen has produced. It is not simply a question of the female voices' naturally being more flexible than the male, and therefore offering more potential to the inventive composer. Heininen really has succeeding in prizing something essential out of his figures. The chorus plays a large and important role. It both comments on the events like a Greek chorus and creates some kind of living sound-facade, sometimes onomato-poetically, as a background for everything else. The material for the chorus part includes a large collection of different water sounds, which manage to make the lake alluded to on the opera stage seem a much more realistic proposition. Ballet is required in the realisation of the demon-scenes, and given the strength and vigour of the music one would imagine that any choreographer worth his salt would be inspired to produce something special. The orchestra maintains a powerful and colourful presence, and not for a moment does its role lapse into that of mere accompaniment for the singers. In the early scenes we can hear a whole host of delightful chamber music-like ideas; the score plays slenderly and airily and leaves enough room for the aria-like numbers of the soloists. The close is dominated by a chase of powerful tutti resolutions, in which the percussion is given a central role, a move typical of Heininen's work in general. The Damask Drum can justifiably be regarded as Heininen's most important composition so far. It works splendidly on all levels and fronts and is a fiercely original individual contribution to the old argument of exploiting all the possible artistic and technical resources in a single work. It is also a humane address to the audience on a subject both important and rather sensitive - a tender spot, even though it is such an old and familiar story. For all that, I still feel inclined to say that the greatest importance of The Damask Drum lies in its being a quite different type of Finnish opera at a time when the image of Finnish music theatre as a whole has become somewhat warped and one-sided by the profusion of works on subjects taken from our national history. The Damask Drum shows that a timeless and universal theme is the most durable basis for opera, too, although there are so many special demands placed on the composer of this much-maligned and difficult art-form that there is not always room left in the creative mind for real thinking of this kind. The autumnal tale of the solitary gardener has not yet travelled outside Finland, but personally I am convinced that the already considerable triumphs won by Finnish opera abroad could be continued through The Damask Drum, perhaps even on a hitherto unimagined scale. This article was first published in FMQ 2/1986 and is now re-published with the kind permission of Jouni Kaipainen’s family.